A combination of quantitative phase imaging and Raman microspectroscopy techniques is paving the way toward quick, automated, label-free detection of acute infectious diseases such as malaria. Following unprecedented success in controlling malaria worldwide, progress is now slowing. In fact, a 2017 report by the World Health Organization (WHO)1 clearly indicates that the world is no longer on track to reach the critical milestones for identifying and treating malaria that have been set by the WHO global technical strategy through 20302; the organization’s plan calls for an at least 40 percent reduction in malaria case incidence and mortality rates by 2020. Preventive solutions such as vector control and chemoprevention are recommended by the WHO, but there remains the need for innovative analytical testing for prompt and accurate diagnosis. This is essential to reduce onward transmission rates and avoid unnecessary prescription of antimalarial medicines that would increase the development of resistance mechanisms. In this context, Dr. Pedro Alonso, director of the WHO Global Malaria Programme, has called on the global health community to reach the $6.5 billion annual investment that will be required by 2020. This estimated cost of implementation — which includes goods required for interventions, treatments, analysis, and surveillance — does not take into account the additional funding of up to $822 million needed annually for research and development. This global investment effort includes contributions from both domestic — countries where malaria is endemic — and international sources, and can only be ensured through a strong collaboration among private industry, research and academia, private-sector health facilities, nongovernmental organizations and community health workers, and national public health programs. Encouraging cross-border and multisectoral collaborations, as well as private sector and nongovernmental organization participation, is an essential factor of success. Treating patients with malaria — a mosquito-borne infectious disease caused by protozoan parasites of the Plasmodium genus that infect red blood cells (RBCs) — involves the determination of three parameters: parasite species, parasitemia (the rate of infected blood cells), and development stage. Microscopy remains the mainstay of malaria diagnosis in most large health clinics and hospitals. However, this requires experienced staff. And the observation of hundreds of fields of view of thin-film-stained blood smears at 100× magnification can be very time-consuming. Figure 1. The Phasics SID4Bio quantitative phase imaging (QPI) device plugged into the video port of a microscope. No additional optical setup is needed, and it is compatible with classical microscope workflow and environment. 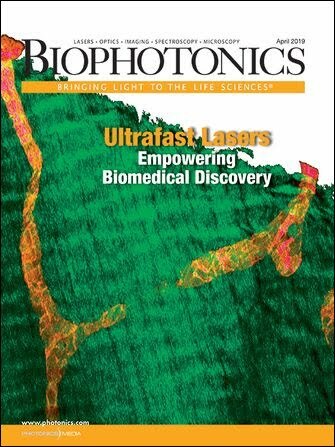 Courtesy of Phasics Corp.
Quantitative phase imaging (QPI) — an imaging technique that measures the optical path difference of light traveling through a semitransparent sample — has been identified as a fast and easy automated method for infected blood cell detection. If a biological sample shows local optical refractive index changes, the obtained QPI image reflects this inhomogeneous refractive index distribution with quantitative values. Such images typically exhibit a contrast that is more than two orders of magnitude higher than conventional bright-field microscope images. In addition, they provide quantitative information about the relative index change in the sample. A case study was conducted in a collaboration between researchers from Phasics, TRIBVN, MEDyC (FRE/CNRS 3481), and the parasitology-mycology laboratory of the CHU de Reims in France. The group used the SID4Bio commercial device from Phasics (Figure 1), which is based on quadriwave lateral shearing interferometry (QWLSI) — Phasics’ proprietary technology that allows quantitative phase measurements using a camera-like instrument that plugs into any conventional microscope for potential parasite detection — in combination with Raman microspectroscopy, for confirmation based on the parasite molecular signature detection. Both methods address the automation of the malaria parameters acquisition. Figure 2. Depiction of the quadriwave lateral shearing interferometry (QWLSI) principle. A SID4Bio is composed of a 2D diffraction grating called a modified Hartmann mask (MHM) and a CCD detector (a). The incident wave is replicated in four waves that will interfere with each other after a few millimeters of propagation (b), which creates an interference pattern. Courtesy of Phasics Corp.
Lateral shearing interferometry3, a classical technique used in optical metrology to measure wavefronts, can also help diagnose diseases such as malaria. However, this is a one-dimensional technique that lacks information to recover the full two-dimensional phase field in the image plane. Multilateral shearing interferometry extends this principle to more than one direction. QWLSI uses four replicas created by a specific two-dimensional diffraction grating (Figure 2). After propagation, their mutual interference pattern is recorded with a CCD camera. The phase gradients are recovered from the interference fringes distortion using a Fourier deconvolution around the interferogram fringe frequency. In this case, two gradients along two perpendicular directions are measured and then integrated to determine the field intensity and phase. Compared to other interferometric methods applied to microscopy — among them are digital holographic microscopy (DHM) or spatial light interference microscopy (SLIM), which also allow for label-free phase measurements on living cells — the QWLSI method is self-referenced. All is integrated in the camera, and since there is no reference arm, it is not sensitive to vibrations. No complex optical setup means there is no need for optical tables or optical alignment procedures. Finally, a simple camera that plugs into a video port of any microscope is more compatible with the need for compact and easy-to-use diagnostic methods, especially in an operational microbiology laboratory environment or in a remote area where space and equipment can be limited. Figure 3. Parasite characterization. The red solid circle indicates a healthy blood cell; the blue dashed ellipse indicates an infected blood cell (a). QPI raw images (b, left) with their corresponding phase profiles (b, right). Courtesy of J. Klossa/TRIBVN and M. Manfait/MéDIAN Unit, UMR CNRS 6142, France. When a Plasmodium parasite infects a blood cell, it synthesizes a complex molecular structure from hemoglobin, called hemozoine. As these two molecules present different refractive indices, it is expected that they induce differences in quantitative phase images of RBCs. After several experiments and observations at different magnifications, researchers have found that the presence of a parasite inside a blood cell induces a clear drop in phase values (Figure 3). Figure 4. Blood smear observation and parasite detection using QPI on unstained samples. One field of view at 40×, NA = 0.6. Raw quantitative phase image (a). Filtered and processed phase image (b). Courtesy of J. Klossa/TRIBVN and M. Manfait/MéDIAN Unit, UMR CNRS 6142, France. This characteristic has been applied to the observation of large populations of nonstained RBCs, and with success (Figure 4). Large fields of view of QPI can be automatically processed to extract the number of healthy and infected RBCs. This allows for the parasitemia calculation (rates of infected RBCs). Parasite detection is achieved through a three-level segmentation process applied to quantitative phase images. The first level corresponds to the extracellular matrix surrounding RBCs, the second level is related to the RBC cytoplasm-containing hemoglobin, and the third level is linked to the presence of hemozoin. Thus, the second segmentation level is used to compute the total number of RBCs, while the third one leads to the number of parasites. This finally allows us to compute the parasitemia. Figure 5. Example of normalized Raman spectra. Infected blood cell (red); healthy blood cell (blue). The red spectrum exhibits the representative peaks of the hemozoin biocrystal (i.e., 1380-1385, 1594-1597, and 1644-1646 cm-1). Courtesy of J. Klossa/TRIBVN and M. Manfait/MéDIAN Unit, UMR CNRS 6142, France. Raman microspectroscopy, used for diagnosis confirmation, is based on Raman scattering. When illuminating a sample with a laser, shifts of energy in the scattered light induced by molecular vibrations give information about the sample chemical composition. In the case of malaria diagnosis, the disease confirmation is obtained with the presence of the representative peaks of hemozoine crystals in the spectrum (Figure 5) — that is to say, the presence of the chemical molecules constituting hemozoine crystals. These results are detailed in a study conducted by Phasics and its collaborators4, which shows that combining the QPI technique proposed by Phasics with a molecular method is particularly efficient on nonstained samples. Preliminary results on reference samples with known parasitemia showed promising agreements as well. Further studies must be conducted, however, specifically to assess the capability of this technique to determine a parasite species and its development stage. It would pave the way toward a fast, label-free, automated malaria diagnostic test that requires neither staining nor experienced staff. Subsequently, this would help to decrease the 200 million malaria cases occurring each year. Beyond the case of malaria diagnosis, this study points out the synergy between fast detection with QPI and selective molecular imaging with Raman microspectroscopy. Together they form an efficient parasite detection and counting toolkit that could be applied to the detection of any sort of parasite or bacteria. It could even be extended to cytology and likely to the field of histopathology. Today, pushing the development of such diagnostic technologies is crucial, as it can help to solve global public health problems such as malaria, as well as tuberculosis and cholera. These infectious diseases are part of the 10 main causes of death in low-income countries. Accurate and fast diagnosis also plays a great role in the fight against antimicrobial resistance, which is another topic of great concern for worldwide health. Misuse and over-prescription of drugs — partly because of a lack of innovative diagnostic methods — is currently completely changing the way we fight infections, and is already complicating the treatment and prevention of malaria, tuberculosis, and HIV. The cost of health care is increasing. And according to Dr. Margaret Chan, former director-general of WHO, modern medicine as we know it may be reaching its end. A new era has come — a post-antimicrobial era where a simple scratch on the knee could prompt major health problems. Valentin Genuer is business developer at Phasics Corp. in San Francisco (the U.S. subsidiary of Phasics, based in France). He received his Ph.D. in optics from Grenoble-Alpes University and CEA-Leti, and a Dipl.-Ing. degree in optics and photonics from Institut d’Optique Graduate School in France. He holds a patent on a system for fast identification of human pathogens using elastic light scattering, developed during his Ph.D. program; email: genuer@phasics.com. 1. World Health Organization (2017). World Malaria Report. http://www.who.int/malaria/publications/world-malaria-report-2017/en/. 2. World Health Organization (2015). Global Technical Strategy for Malaria 2016-2030. http://www.who.int/malaria/areas/global_technical_strategy/en/. 3. P. Bon et al. (2009). Quadriwave lateral shearing interferometry for quantitative phase microscopy of living cells. Opt Express, Vol. 17, Issue 15, pp. 13080-13094. 4. Klossa et al. (2013). Quantitative phase imaging and Raman micro-spectroscopy applied to Malaria. Diagn Pathol, Vol. 8, Suppl 1:S42.